Hallelujah! 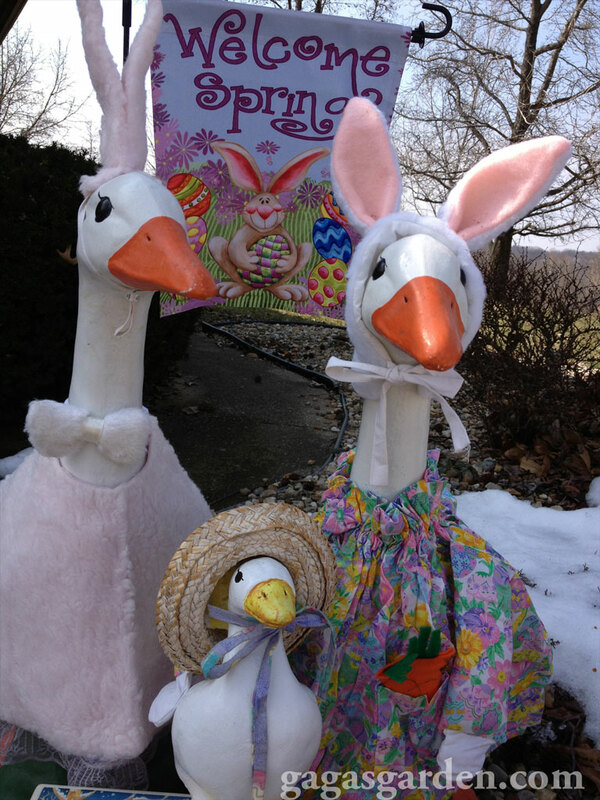 The geese family is all decked out in their Easter Regalia. 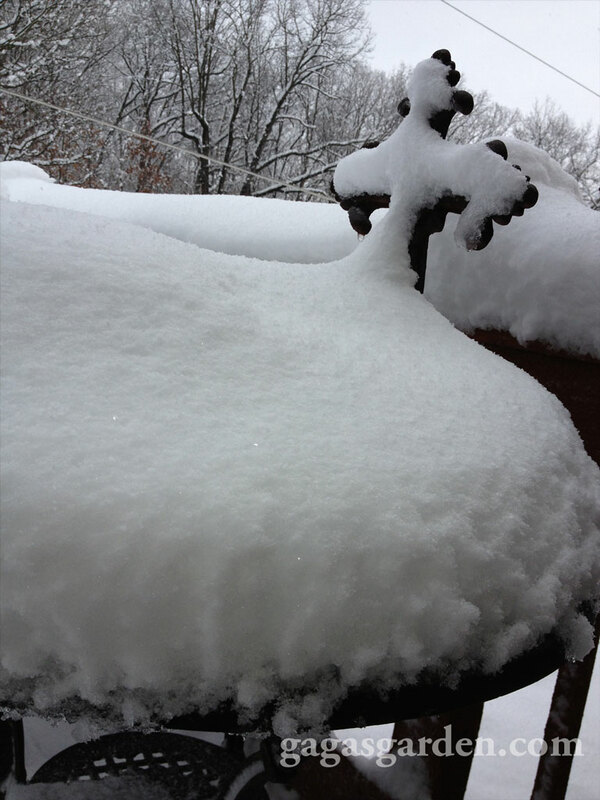 It was touch and “snow” due to snowmageddon. Readers of Gaga’s Garden will remember when the Geese Girls were kidnapped from their Plano, Texas home one Easter never to be seen again. 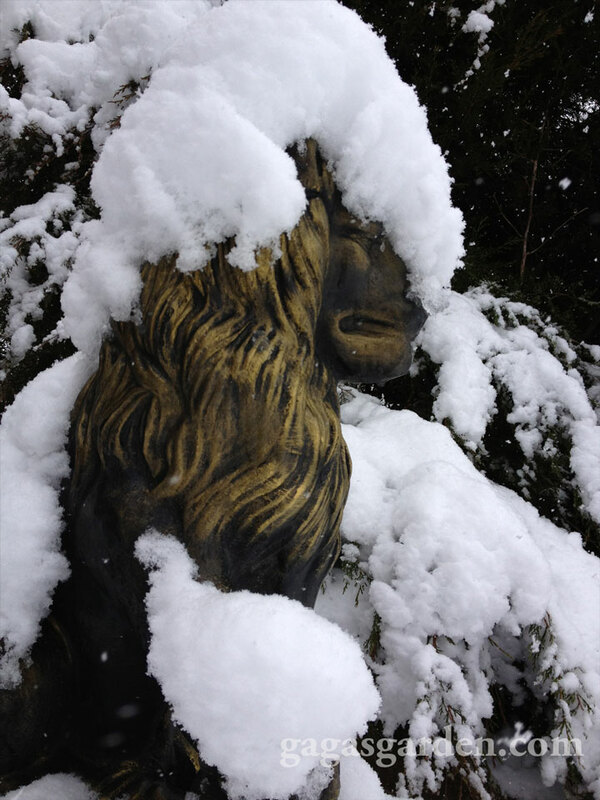 Everyone was saddened by their disappearance. They were loved by neighborhood children and adults alike. Touched by my dismay over their disappearance friends rallied and located another family of geese and adopted them for me when I moved from Texas to Illinois. Much to my enchantment they were here in the yard when I arrived from Texas. 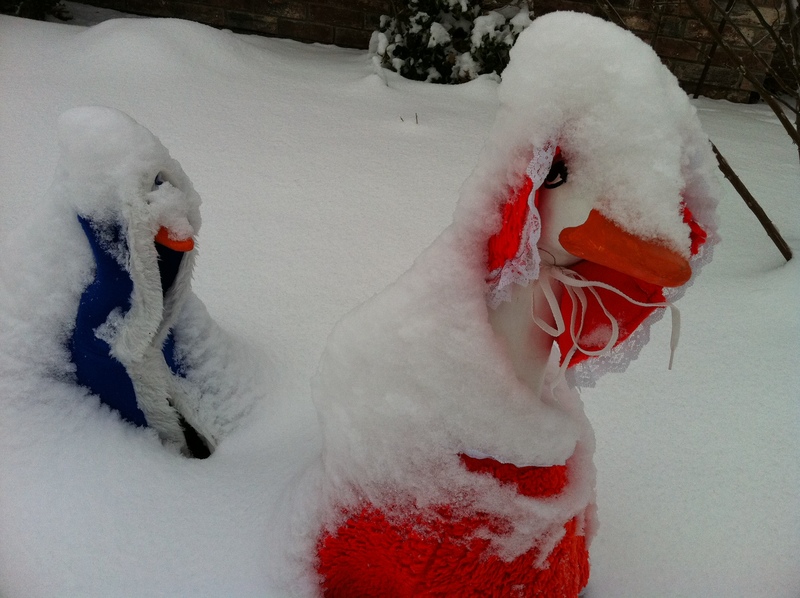 Since we had 15″ of snow last week and temperatures in the 20’s in S. Central Illinois I was wondering whether the proud Geese Family would still be buried in a snow bank. A friend said to me once “what a lovely hobby you have” referring to rose gardening. I remember I was taken aback by the word hobby because growing roses is so much more to me than a hobby. I feel gardening is good for the body, mind and soul. There is a spiritual element to being one with nature, digging in the dirt and watching a garden become a creation. There are quiet, reflective and meditative times alone in the garden that are some of the most intensely satisfying moments one can imagine. You can truly be present in a moment in your rose garden. It can be even better if you take care of yourself, so you can continue working in your garden and it will reward you far more than you can imagine. Thank-you so much for your continued support of my writing. I do appreciate it. I hope you have a wonderful day. This is SOooooo cute! Love the back story also. I was so sad when the original Geese Girls were taken literally from the front door in Plano. And did you know my sweet husband was the one who first bought the geese. So you see I am quite taken with them. And I have clothes for all seasons. Kids young and old do enjoy the frivolity of them. I’m glad you like the story. Happy Easter dear lady! I wish you did live in Illinois! Then you could come visit me. In fact come visit anyway. I’m told my guest room is like a well run hotel, lol. Oh my goodness! Love the garden geese. I’m sure they are ready for some sun on their feathers. My husband first introduced me to these delightful creatures! My first set was stolen in Plano and I wrote about it. I have outfits now for the new family for all the holidays and all the neighborhood kids, young & old really delight in seeing them. I’m glad you like them. Great post! Cute Geese Girls! I am so glad I have my geese family back. They warm my heart. And how do you like the little baby in her bonnet? Did Tina get any geese? Happy Easter to you and your geese family! I love their outfits and look forward to seeing more of them. Happy Easter to you and Randy! Yes they are all decked out and next holiday I guess is their Memorial Day outfits! I enjoyed your articles and pictures! 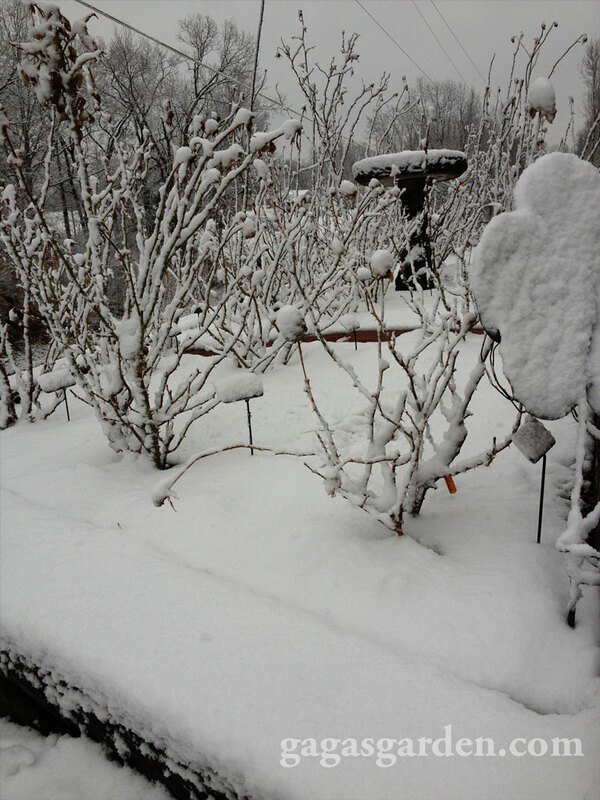 I have pictures of my garden in snow mid April and use it in programs as a reminder to be patient and wait for spring!